When it comes to picking our ‘Supremo,’ we look at what’s happened in the world of Sport on the weekend, which gives us an idea of maybe 5 or 6 sporting figures or teams that it might be. If any of them perform again on the Tuesday or Wednesday, it can cement their pick……… and this week there was only one man! The Scotland National team have had a rough ride over recent times, with the odd result or performance against England at Hampden a bright spot on an otherwise bleak landscape. Many thought the newly formed Nations League would give The Tartan Army a chance to get some goals on the sheet, wins under the belt and points on the board, but this was proving difficult as every man and his dog pulled out of Alex McLeish’s recent squad. With half of the SPFL sat by the phone and half of professional players south of the border frantically checking birth certificates for a McGrandad, a depleted Scotland took the field to face Albania and Israel, hoping for a supremo to emerge. 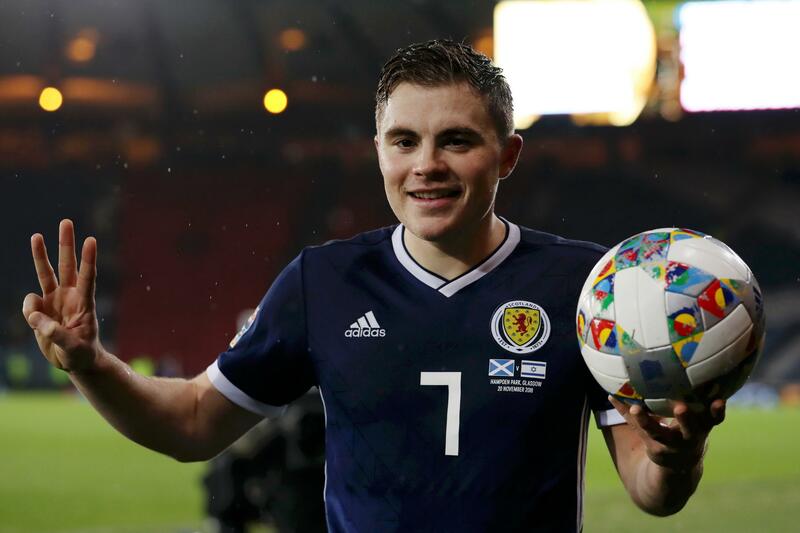 As mentioned earlier, a performance at the weekend can put you in the frame and this week’s ‘Sports 360 Supremo,’ James Forrest did just that, with two really well taken goals away to Albania, giving his Country the chance to end the Nations League campaign with promotion and some long over due positivity. All they had to do was beat a handy Israel team that had defeated them already in October and with an in-form Forrest in the ranks, anything was possible. Going behind early on wasn’t part of the plan, but all that did was set the scene for Forrest’s second finishing master class inside a week. Three outstanding finishes to match his weekend exploits were enough to carry Scotland over the line and into Group B and the Euro 2020 Play-Offs. A man who hadn’t found the net in his first 24 caps, now has 5 goals in 26 caps, 5 goals in a week, 5 goals in 99 minutes and 12 in his last 11 games of football. This Forrest, it would be fair to say, is on fire. A boy who was equally talented with a tennis racket as he was a football, joined Celtic’s academy at the age of 11 and went on to represent Scotland at every junior level as well. Progressing through the ranks at Celtic Park, Forrest made his Hoops debut on May 1st, 2010, scoring against Motherwell in a 4-0 victory. It’s fair to say he hasn’t looked back since and at the age of only 27, Forrest has racked up 7 Scottish Premierships, 4 Scottish Cups, 3 Betfred Cups, SFWA & PFA Young Player of the Year awards (2011/12), 77 European appearances, 312 career appearances and 64 goals. Forrest earned his first International cap against the Republic of Ireland on May 29th, 2011 and although in and out of the team throughout the following years, it’s a fair assumption that he might now be a pillar of this bright new team. Who knows what a Scotland team with an in-form Forrest, Fraser, Tierney, Robertson et al could achieve. In a week when Scotland’s most famous Number 7 received a well-deserved Knighthood, the current incumbent of the Number 7 jersey might be about to receive an unofficial one from the terraces of Hampden and with experience of playing in the Champions League and Europa League and winning trophies, we might be about to hear a lot more of this week’s ‘Sports 360 Supremo,’ James Forrest. Find out about the latest events, sponsorships and deals by Sports 360. If you would like to know how we can help your brand reach new customers, contact us today.